Now I'll hand over to Maria Grace for a guest post about home medicine and a very exciting scene cut from the book. During Jane Austen’s day, the practice of medicine as we know it today was still in its infancy. Formally trained doctors were unavailable to many either because of cost or distance. Consequently any of the curative arts were practiced at home. William Buchan’s book Domestic medicine or the family physician. William Buchan was born in Scotland in 1729. Even before his formal training he served as an amateur doctor to his village. In 1758 he qualified in medicine. The following year he served as the first surgeon and apothecary to a Yorkshire branch of the Foundling Hospital. Experience gained in this post influenced his MD dissertation for Edinburgh University On the preservation of infant life (1761). 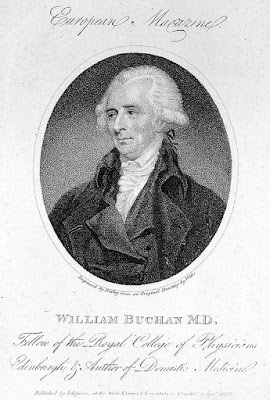 In 1769 Buchan published his seminal work, Domestic medicine or the family physician. It was the first text of its kind. Previous medical texts were theoretical and written for well-educated readers or were brief manuals not descriptive enough to be helpful. Buchan wrote Domestic Medicine in lay terms. It described both the diseases and treatments clearly enough that untrained people could fabricate the necessary remedies. Priced at just 6 shillings, it was an immediate success. 80 000 copies from the 19 (English) editions of the book sold during his lifetime. Beyond Buchan’s native English, Domestic Medicine was translated into all the major European languages, even Russian. The text remained in print until 1846 in Britain, and 1913 in the Americas. Unfortunately, many of his remedies were no better than was currently in use at the time. Many of the cures were grounded in the theories of bodily humors, making him a proponent of bloodletting and purging as cures. Moreover, he proposed that too much of any one ‘non-natural’: air, meat and drink, sleeping and watching, exercise and quiet, evacuations and obstructions, and passions could result in an illness inducing imbalance. Thus, he advocated letting nature take its course by helping a patient reset to a natural ‘set point’. Still, though, he was ahead of his time. More than a third of his book related to the prevention of disease by such (in today’s eyes) common sense measures as fresh air, exercise, hygiene, cleanliness and inoculations. He also encouraged breast feeding as a means of reducing infant mortality and opposed the use of stupefactives on children. On 25 February 1805 Buchan died at 76. He was buried in Westminster Abbey, leaving a legacy on medicine that we still feel today. In A Less Agreeable Man, Mary Bennet looks for a copy of Buchan’s text during a disastrous fire at Rosings Park. The scene did not make it into the final version of the book, but I thought you might enjoy a peek at it here. Buchan W. (1784) Domestic medicine or a treatise on the prevention and cure of diseases by regimen and simple medicines. (H Chamberlain and others, Dublin), 9th ed..
Archives of Disease in Childhood - Fetal and Neonatal Edition 2000;83:F71-F73. Mary slapped her forehead and sat back hard. She clenched her first and sucked in several deep breaths, counting until the harsh words on her tongue subsided. Not everyone had lived with a physician who pontificated loud and long on preferred remedies and formulas. And the need to be prepared for the vicissitudes of life. Apparently, those of high enough rank did not need to anticipate vicissitudes. She clutched her temples. Impatience with Parkes would serve no one well right now. “Have you a copy of Buchan’s Domestic Medicine in the house?” Pray let at least that much be available. “Yes, of course.” Parkes waved down a young groom who looked anxious to be away from the dead and injured. Then she took a pile of wet sacks from a young maid and directed her run back to the manor with Mary. “Start moving the casualties to the house immediately.” Mary called over her shoulder, forcing herself into a trot back to the house. How was it possible that a place as large as Rosings could be so ill-prepared for such an event? Truly, it had nothing to do with adequacy of resources, and everything to do with the mentality of its mistress. It was one thing to rely upon the physician she patronized for major issues, but there was no reason the household should not be prepared to handle more mundane crises. No wonder Lizzy had always seen to the needs of the servants. How many of those needs could have been addressed by a simple copy of Buchan’s text? How much unnecessary expense at the apothecary’s could have been spared by preparing remedies at home? She would address that matter with Fitzwilliam if—no when—when he recovered from his injuries. And with Michaels, too. Any new place to economize would be most welcome news to him. She entered through the kitchen and lit a candle from the fireplace. Half eaten platters and dishes from dinner were scattered along the work tables, left where they landed when the kitchen staff answered the call of “Fire!” Empty halls echoing with unnatural stillness provided an eerie foil from the bedlam outside. The still room—even more still than usual—invited her in with dusty herbal scents that hung upon the quiet, stuffy air. It should have been full, shelves brimming with baskets and jars, bundles of drying stuffs hanging from the rafters. The floor should have been a jumble of boxes, large earthenware crocks and more baskets. How long had it been since someone had actually seen to its stocks? One more thing to deal with later. She picked along the walls, candle held close to the shelves, squinting in the flickering light. Pray let there be something useful here! Yes! A half-full basket of dried poppies! Those would provide sufficient poppy tea to relieve the injured for at least a week, perhaps more. Several bottles of prepared calamine forgotten on a shelf! On another wall, a high shelf offered a box of yellow wax, one of white resin and a jar with frankincense. Those would make sufficient yellow basilicum for the time being. Excellent. It would not take too much time to prepare. If only—yes!—there it was! A box of quick lime on the floor, enough for gallons of lime-water. Providence had granted enough to meet their immediate needs. Trials and hardships would always be there, but thankfulness was still a virtue she could hardly afford to do without. A scullery maid, scent by Parkes, scurried in. They carried the supplies to the disordered kitchen where the maid quickly cleared a work table to receive them. Proportions, what were the proportions? It had been a long time since she had helped Mama prepare the ointment. Mary paced in front of the low kitchen fire, pressing her temples and muttering to herself. Yes! One part yellow wax, one of frankincense and one of white resin to be melted together then added to four parts of melted lard. She had not forgotten. She could do this. The maid fed the fire, encouraging it to something more useful. A large melting pot went on the hob near several kettles of water. Those were for the poppy tea. Now, lime water for washes. A pound, yes that was it, a pound of quick lime—that was close enough—and how much water? One gallon, no, that would not be enough. It must be two. She added the lime into a large basin and poured the water over, wincing at the violent reaction. Filter paper? Where would that be? The maid ran for it and returned before Mary could even ask. She was a quick study. Perhaps it was time to move her into higher work, perhaps assign her to the still room. “Bring me clean jugs and corks for the lime water while I finish the basilicum.” Mary added the lard to the melting pot and stirred until it was thoroughly incorporated. She removed the pot from the fire, covered it with a clean cloth and set it outside to cool. The kettles were boiling. Where were the poppies? There. Why had they not been properly cleaned? Blast and botheration. She probably should be grateful that they were even available, but was it really too much to ask that they might have been properly prepared? Had Parkes even noticed? Or was she kept too busy to properly manage the still room by Lady Catherine’s incessant demands? Stop. That could be dealt with later. Focus on the immediate needs. She plucked debris from the poppy heads and added them to the hot water. They would steep on their own on the hearth. Had it been long enough for the lime water to settle yet? The girl nodded, a slight look of terror in her eyes. 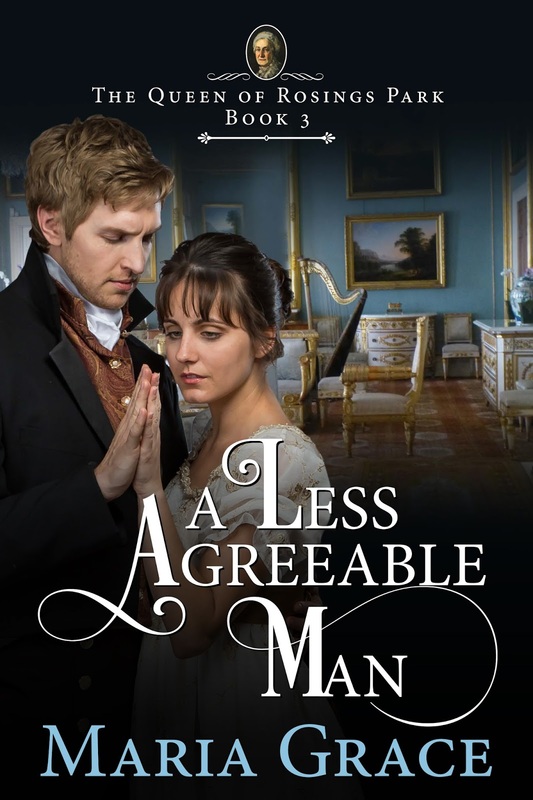 Maria Grace is kindly offering an ebook of A Less Agreeable Man to a commenter on this post. You could let us know what you thought of the cut scene, medical knowledge at the time, the idea of the book or anything else you'd like. This is open to international entrants, who comment by the end of the day on Sunday 10 September. Please ensure you leave a way for me to contact you in case you are the lucky winner. 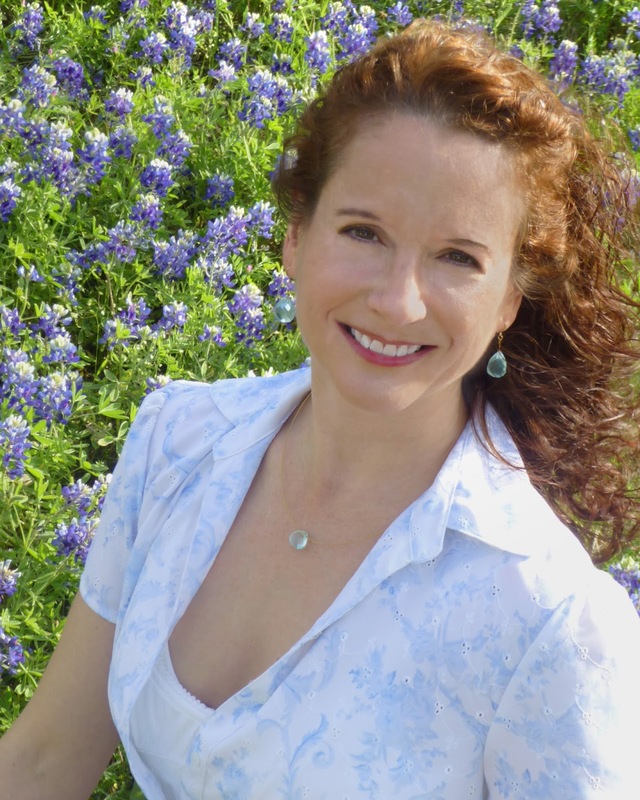 Many thanks to Maria Grace for the guest post, which contained information I'd never heard before, and the scene, which tied in so wonderfully with it! I really enjoyed the scene too, Vesper, and was happy to be able to share it here so that you can enjoy it. Love you P&P variations, so far have read all of them and making grabby hands at this newest one too! When you put it like that, Annika, I can identify with her too! I can't wait to read this book and get to know this Mary! (Loved Books 1&2!) Thank you for the glimpse into medicine at the time and for the excerpt. I'm curious to read more and why it was cut. I enjoyed learning more about the medicine too, Laura, I had no idea. I know this might be considered a lame comment as it is not on the blog post content which is stellar but doesn't the man on the cover look like Dan Stevens? Love it! Comment on what strikes you, Kneyda :) I see the resemblance, there definitely is one! This sounds like a fantasric read! I must admit that I like this version of Mary and think her a suitable partner for Colonel Fitz. Yes,I think he's met his match,in more ways than one,and think she's just the woman for him! She understands that he's suffered but won't allow him to use this nightmarish experience against others. Best of luck with this book,Maria. Cheers Ceri for such an interesting post! Thanks Mary! Glad you enjoyed this post. I like this Mary too. I haven't yet read the first in the series, so I am not acquainted with this version of Mary. She wasn't in the 2nd in the series. I love books which feature poor, overlooked Mary Bennet. I do want her to receive her HEA! Thanks for a chance to win a copy! Me too, Pamela, I love to see Mary get some attention. I loved practical and quiet Mary, who was not meek after all. A nice scene, I wish it was not cut out. Yes, it's nice to see Mary coming into her own isn't it. I enjoyed the scene too. I do love reading the story of a physician that was ahead of his time and not just a dangerous quack. I tremble whenever I read about the remedies back then. :) Thanks for the interesting medical post, Maria, and congrats on the new release! Yay for Mary in a crisis. Look forward to reading her story. A few times I have blessed science and the fact that I didn't live in Regency times! Wow! All that work in the stillroom was probably left over from when Lizzy made sure everything was in place... before she left Rosings. This sounds awesome. I can't wait to read it. jwgarrett13@hotmail.com Blessings on the launch of this work. 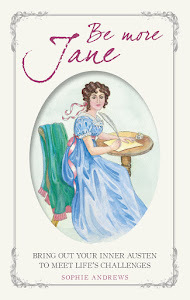 It seems like a good read, I hope you enjoy it Jeanne! Hope you enjoy it, Becky! It sounds pretty bad doesn't it! Love the cut scene and Mary's attempts to stay calm and focused. 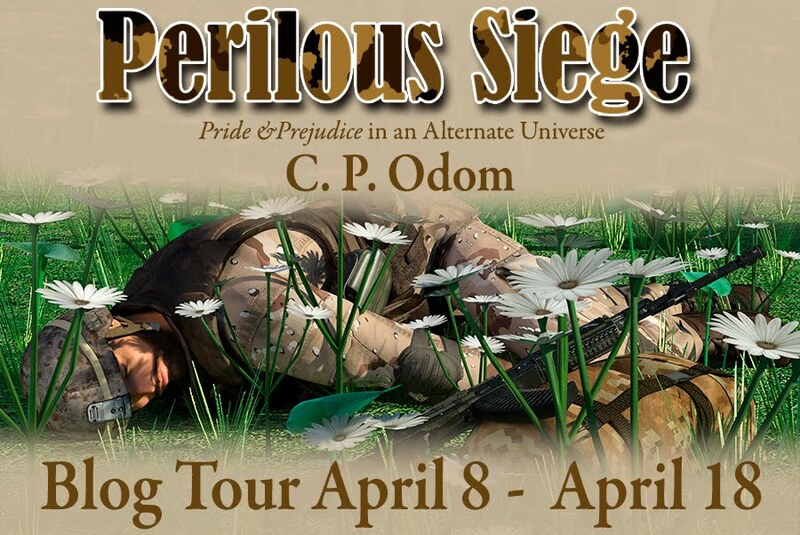 I may print this out and save to go with book! It is amazing how far medicine has come but how many 'old' remedies are still used today! I've been following the book on Maria's blog! What a tantalizing cut scene! Can't wait to read the new book! Glad you enjoyed the scene, Leah! How times have changed! Mind you, solutions containing lime were still in use as antiseptics as recently as the 1980s. I should know - as a pharmacist, we still used to get prescriptions for it! No need to enter me in the giveaway Ceri. It's a great story and a fitting end to the series. That's interesting, Anji, I would have no clue! I just wish the scene is added back into the book as it shows Mary as tough and resilient when she herself is injured as well. Thanks for sharing medical knowledge in the early days, Maria. I was a bit surprised it was cut too, I really enjoyed this scene! Congrats on the new release! Every time I think about Regency medicine and practice it makes me ring a little... ok maybe a lot! I can't believe people actually survived some of the stuff they did back then. I'm glad we live in the 21st century! Love this Mary! I can't wait to read more of her story. Regency medicine was harsh, wasn't it Dung, it makes you wonder how people survived it. I also wonder how I would have managed with some of the work I've had done. It's possible that without my c-sections my children and myself may have survived but I dread to think what would have been the result of my dislocated hip and broken ball joint! Of course, on the flip side, I wouldn't have been playing netball so that injury may have been caused and cured by modern times :) I hope you enjoy this book when you read it.